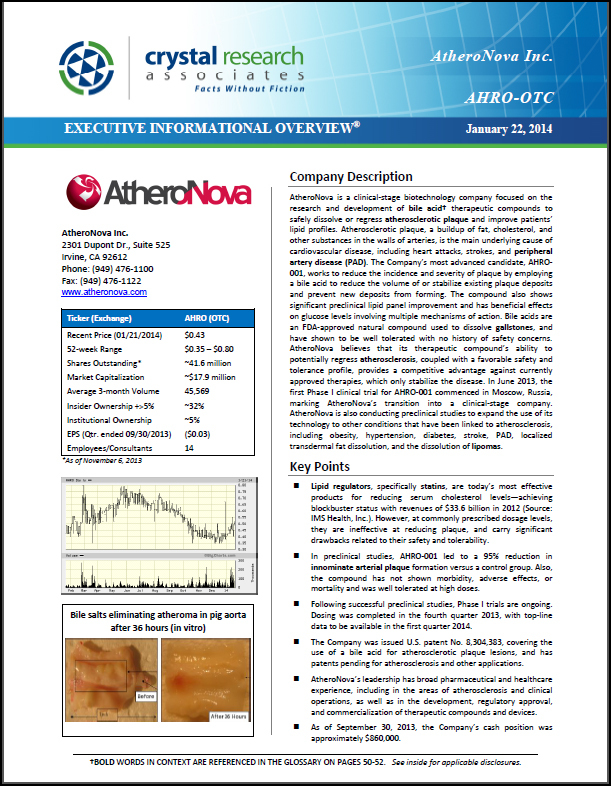 AtheroNova is a clinical-stage biotechnology company focused on the research and development of bile acid therapeutic compounds to safely dissolve or regress atherosclerotic plaque and improve patients’ lipid profiles. Atherosclerotic plaque, a buildup of fat, cholesterol, and other substances in the walls of arteries, is the main underlying cause of cardiovascular disease, including heart attacks, strokes, and peripheral artery disease (PAD). The Company’s most advanced candidate, AHRO-001, works to reduce the incidence and severity of plaque by employing a bile acid to reduce the volume of or stabilize existing plaque deposits and prevent new deposits from forming. The compound also shows significant preclinical lipid panel improvement and has beneficial effects on glucose levels involving multiple mechanisms of action. Bile acids are an FDA-approved natural compound used to dissolve gallstones, and have shown to be well tolerated with no history of safety concerns. AtheroNova believes that its therapeutic compound’s ability to potentially regress atherosclerosis, coupled with a favorable safety and tolerance profile, provides a competitive advantage against currently approved therapies, which only stabilize the disease. In June 2013, the first Phase I clinical trial for AHRO-001 commenced in Moscow, Russia, marking AtheroNova’s transition into a clinical-stage company. AtheroNova is also conducting preclinical studies to expand the use of its technology to other conditions that have been linked to atherosclerosis, including obesity, hypertension, diabetes, stroke, PAD, localized transdermal fat dissolution, and the dissolution of lipomas. * The Corporate Snapshot was last updated on January 22, 2014.